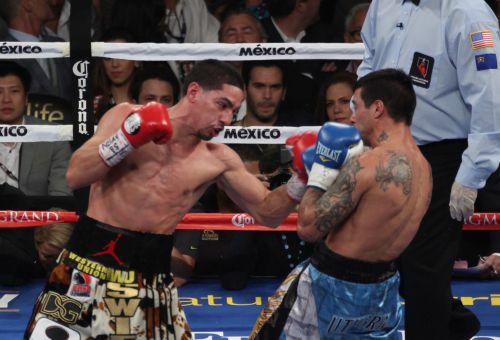 The MGM Grand Arena in Las Vegas was the host of the World Boxing Association super lightweight title fight where Danny Garcia defeated his Argentinean opponent Lucas Mathysee and retained his championship besides improving his undefeated record to 27 victories. Garcia overpowered the southern in all rounds, showed effectiveness in his combinations and hurt Mathysse right eye early. The scores favored him 115-111, 114-112 and 114-112. The fight was the most exciting of the night, and made the public part of it during the 12 rounds of actions and made people applaud, jump and cheer evey action in the ring. After the fight Mathysee admitted “he is a great champion and I thank the opportunity for fighting this title”, and that in spite of having his eye closed almost half of the fight “I made a great fight”. Then he said, “The only way to stop him was going to the body. I knew I had 12 rounds to work on that, I did not want to burn my cartridge in the six first rounds “.